With the latest portable PCs, working on the move has never been easier, but laptops are still slaves to the National Grid. You can do practically anything on a modern laptop, but their advanced features drain battery life to the extent that you can only get a couple of hours out of your laptop before it turns up its toes. While battery life is a chief cause of mobile moans, it's possible to get significant improvements by simple good practice and a few software tweaks. To help you get the most from your laptop battery, here are seven easy ways to make it last longer. The screen is one of the most power-hungry parts of the laptop. It takes serious amounts of battery power to keep your display looking clear and bright. Saving this power is simply a question of turning the brightness down. The screen brightness button is usually located as a second function of one of the F keys, and is represented by a little sun symbol with up and down icons. To use it, just hold down the correct function key and then choose up or down. Windows Vista comes with some great power features, which enable you to eke out the best performance when you're plugged into the mains, and optimise battery life when on the move. Type power options into the Start Search box and choose Power saver from the list. The Windows Mobility Center has more methods for saving battery life. These include settings for powering off the monitor and kicking into sleep mode more quickly. One of the biggest battery sappers is the wireless networking capabilities built into most laptops. Wi-Fi drains the battery by constantly drawing power from the battery and, when not connected, looking for networks. When you're using your laptop away from the grid, the likelihood is you're away from wireless networks, so you can turn this device off. Many laptops have a function button that enables you to turn off the wireless adaptor manually to save yourself the unnecessary waste, but older laptops often don't have this. If this is the case, just go to the Control Panel, access the Network Connections menu and disable your wireless connection manually. Using USB peripherals can put a big drain on your system, because your motherboard has to power them, so unplugging everything saves juice. USB sticks, mice and webcams are common offenders, so copy all your information across and eject your devices as soon as possible, and put up with laptop track pads over your USB mouse. Many laptops have function buttons to turn off the built-in webcam, which drains the battery if given the chance. Having a disc spinning in the drive is a huge drain on resources, and many programs constantly do this. 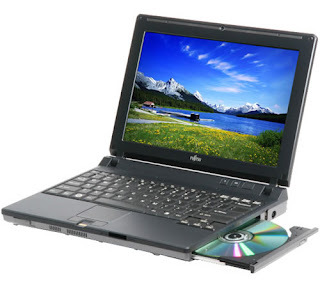 Simply eject your discs before you switch to battery power to gain vital extra minutes from your working day. Good practice can go some way to extending your battery life, but if you need to use your laptop throughout your working day, you're going to need some help. Most laptops come with a six-cell battery, but many manufacturers offer eight- or even 12-cell optional upgrades, which can double your power. The alternative to expensive laptop batteries are products such as the Philips Portable Power Pack, which gives you valuable extra hours for all your devices. The Philips is a compact battery unit that has adaptors for most laptops and mobile phones, which is portable enough to be placed in a bag and has enough capacity to double the length of your charge. Windows Vista has some handy built-in features, but many put demands on your system that are unnecessary when working on the move. Take the simple measure of turning off Windows Aero and the Windows Sidebar when you're on the move to make your laptop more efficient.